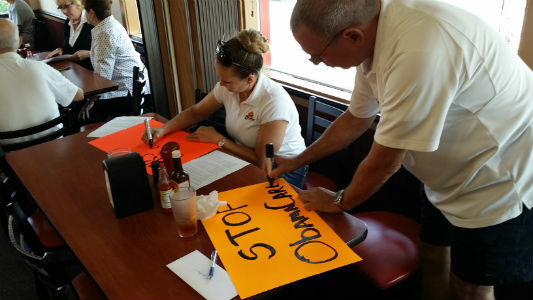 Activists met with two Hagan staffers, with the focus being the role of the Internal Revenue Service in ObamaCare and the ObamaCare insurance company bailouts. One activist, who contacts Senator Hagan's office on an often weekly basis, shared that she had recently received letters saying that her children's life saving medications would no longer be covered by insurance when it previously was. While one FreedomWorks activist was speaking, a Hagan staffer actually rolled her eyes - guess she did not like his message of truth! After meeting with the staffers, activists held a protest on the busy street in front of Senator Hagan's office. Activist signs were rewarded with horns and thumbs up. Those who are demonstrating against the ACA are either part of the 1% or too stupid to know they are demonstrating against their own best interest. Because of the actions of people like these (In NC and else where in the south), there are over 8 million people who are being denied access to affordable health care. The ACA (Obama Care) is the best legislation to come out of congress in 50 years. Do not try to destroy it, fight to expand and strengthen it. Communism is never successful nor good.